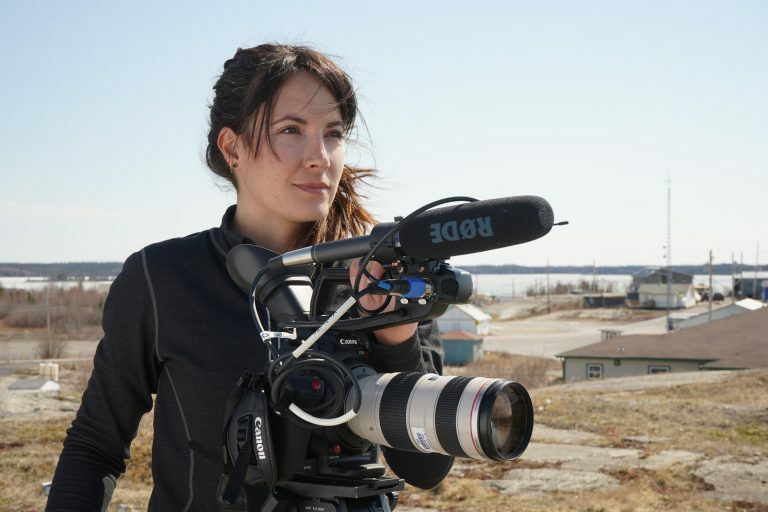 Olivia Fellows has had a busy three years since graduating from UBC Journalism. She’s produced a number of documentaries and series with Great Pacific Television in Vancouver. Fellows was a member of the International Reporting Program team that produced the award-winning mental health project, Out of the Shadows. After graduating, she returned to India to turn the project into a long-form documentary for Al-Jazeera. What’s your current role and what’s the day-to-day like? I’m a producer at Great Pacific Television, which is a production company in Vancouver. I just recently switched roles. I was a producer for Daily Planet on Discovery Channel for about three years. The show just got cancelled. It was horrible. When I got the news, there was lots of tears. I was super sad. It was cool to work on a show where I felt like I was actually helping to bring knowledge of the science and tech sector in Canada and in the world to our audience. I was really hoping I’d be pulled into one of the series that were already being produced at Great Pacific. Right after the show got cancelled, at the end of May, I fell in other roles at the production company. I’m working on an upcoming project for Nature of Things on CBC. I’m also working as a story producer for a show called High Arctic Haulers. That’s supposed to be on CBC as well next year. I also still do a bit of work with the Global Reporting Centre at UBC. Most people think of reporting when they enter journalism school. What does producing entail? It differs depending on what job you have. Daily Planet was a pretty unique show. I would oversee the entire process. I was pitching and researching stories, organizing the whole shoot, going on the shoot as a director. I would also write the stories and be there when they were being edited. Now that I’m story producing and field producing, I usually work on the research and pre-production. As a field producer, I’m there to coordinate everything as it happens. I make sure that people are there on time, that we’re hitting all our story points, that we’re getting all the material that we need. I love the variety. I’ve been lucky enough at Great Pacific to be tasked with so many amazing projects that are so diverse. Every story is different. I get to meet amazing people and get access to things that most people don’t. What did you do immediately after graduating? Right after I graduated, I got a call to expand the project that we had started in IRP. Al-Jazeera commissioned a long-form documentary. I was tasked with co-producing it. I worked on that for about six months after I graduated. I finished in October. Through the video class at UBC and IRP, it clicked that I wanted to work in video and documentaries. I just happened to get a call from Daily Planet the week before my contract expired. It was from the executive producer who I had interned with over the summer. She asked, ‘What are you doing, what’s going on? We’re looking for a producer in B.C. Are you interested?’ It was perfect. The show was based out of Toronto, but I was working in Vancouver. I was the only producer, but I was working out of Great Pacific’s offices. So I had the infrastructure there. Why did you decide to study at UBC Journalism? I got my bachelor’s degree in anthropology at UBC. I was really interested in experiencing new things and meeting new people and stepping into these situations that you’re not familiar with. After my undergrad, I got this horrible job in Vancouver for a year and a half. While I was there, I thought, ‘I need to go back to school.’ As a kid, I had wanted to be a journalist. So I thought, ‘I’m going to do it.’ I applied to the School and got in. At the time, I didn’t want to leave Vancouver, so I just applied to UBC. The program catered to the things I was excited about. They had IRP, which is essentially why I applied. What were some key skills you learned at the school? I did report a little bit for the university newspaper beforehand. I also worked for a dog magazine in Vancouver when I was right out of my undergrad. I learned a little thing here and there about pitching stories, writing content and social media. But it was really nothing compared to what I learned at UBC Journalism. I essentially learned the language of journalism and how to make TV. We had lots of discussions about ethics and the legal aspects of reporting. What was your biggest challenge at UBC Journalism? Figuring out what a story was, which sounds ridiculous. I think it’s one of the biggest challenges for a lot of students – shifting from this academic essay-writing mindset to what is a story and what are people looking for? There are a lot of people who pitch a story around a theme. But people are looking for actual stories involving real things that happen. Tell us about your experience with the International Reporting Program. We worked on the Out of the Shadows project. My team travelled to India. It was really eye-opening to see how mental illness was dealt with in different places. And also how much suffering exists when mental illness isn’t understood. Before the project, I never knew that in certain places, you can get all your legal rights removed because you’re suffering from mental illness. Or that people are being chained up because they had bipolar disorder. It was eye-opening. It was my first time where I was one of the main cameras on a shoot. You’re sort of not there because you’re seeing everything through the lens of a camera. We went to this mental health hospital where people were suffering. But I felt almost removed from it because I was in this videographer mode. The professors in the course were just amazing. There was something about that class and being able to have these real-world professionals analyzing everything you’re doing. It felt like you were working with a small investigative team. Everyone was excited, curious and passionate about this massive project. What would you say to someone considering UBC Journalism? I think you need to really want it. Otherwise, you’re not going to make it in the industry. It’s not something that’s glamorous. You’re not going to get paid a ton of money. So you need to want that for your life. Sometimes I take off for a month and I don’t see my partner and my dog. You need to be OK with doing things like that. I want to keep honing my skills so I can do more projects as a director. I love producing, but I think the ultimate goal is directing more documentaries and series. Vancouver is a city that is teeming with productions. There’s lots of reality TV shows, which isn’t necessarily journalism, but it’s a foot in the door and it’s fun and exciting work. You can definitely use all of your journalism skills to do that.